Previously, on MinerBumping... JTClone Ares planned his ultimate revenge against the New Order. 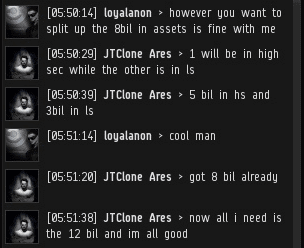 loyalanon agreed to disband CODEdot for 20 billion isk, provided that a safe way of transferring the money was found. 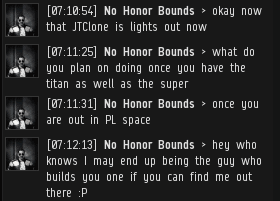 JTClone's "brother", No Honor Bounds, popped up and poured endless praise on JTClone and his honesty. No Honor Bounds invoked his brother's classic maxim, "Risk versus reward." I've written a lot on that subject myself, though I confess I haven't given JTClone his due credit for inventing the concept. Not long after JTClone became a rebel leader, he recorded a speech and an interview about his resistance to the Code. JTClone's secret brother revealed that he had been there all along, eavesdropping from the hallway outside JTClone's room. 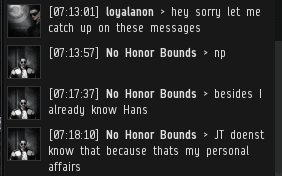 No Honor Bounds was being edited into JTClone's history, Forrest Gump style. loyalanon remained AFK. 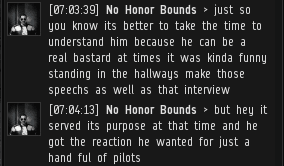 Luckily, No Honor Bounds was a good enough conversationalist to carry on the discussion solo. Well, not as good as JTClone Ares, but you know what I mean. Then the world's greatest brother returned to the crux of the matter: Keeping his agreement with JTClone was the best way for loyalanon to make history. 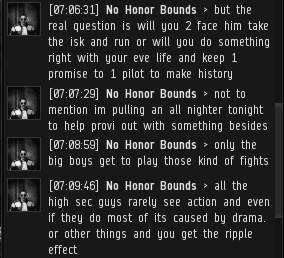 JTClone went to sleep, but No Honor Bounds continued to type into the chat window. What more evidence do you need that they're not the same person? At last, loyalanon came back to his keyboard, only to find nearly half an hour's worth of garbage to sift through. He scrolled back up to screencap everything and promptly closed the chat window. 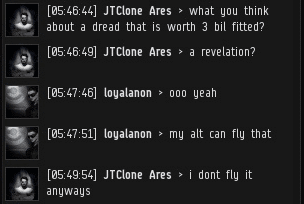 The next day, the official, verified version of JTClone Ares invited loyalanon to a convo. 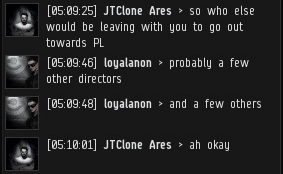 Once again, JTClone confirmed that loyalanon was really going to join Pandemic Legion. From the sound of things, elite forces from CODEdot and PL were basically going to merge. Birds of a feather and all of that. Let's try that one again. JTClone's plan was... One moment, please. Nope, even that didn't work. Moving right along. As far as I can tell, JTClone was talking about defeating the New Order, which would tie up all his loose ends in EVE. Then he would quit the game and "do some stuff" IRL, like maybe win the Superbowl. 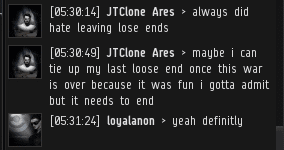 But if you think about it, if JTClone's plan were to be foiled, he would need to keep playing EVE. Scamming JTClone is good for player retention. The state of JTClone's in-game wallet improved substantially from the previous day. He still didn't have all 20 billion in cash, but he could close the gap by giving up all of his ships and equipment. JTClone's alliance would need to take a lower priority as he put his focus on this all-important mission. It probably doesn't come as much of a shock that JTClone never got a lot of use out of his dreadnought. Things were coming together nicely. JTClone Ares now had an excellent shot at making EVE history. Some people learn fast and cheap, some people learn slow and expensive. In my opinion JTClone Ares deserves his own special category. That's it, James. I warned you. I am joining AG. I can't take the suspense any longer. I just wanted to know if the Code. Alliance would survive. Now I don't care. I'm going to spend my time in Uedama following loyalanon like a lost puppy and failing non-stop daily. You know, even this is more convincing lying than JTClone is capable of. i Remembered 2 years ago or so when i was all over the Minerbumping site.Truely i hated it back than ... but as of know ..... this is much better than cable!!!!! and so this latest season is going pretty interesting. But why didnt anti-ganking stop this??? This series will have to make it to it's own novel. A space opera full of drama, intrigue, corporate espionage, double identity, lost brothers, found sisters and all those other cliches. 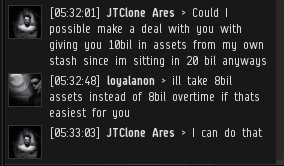 Scamming people and blowing them up IS good for player retention, CCP said so. It's better to learn cheap and fast, than slow and expensive though. Oh well forward to Part 8. You mean part 9. I don't point this out simply for the sake of correcting your error. A 9 part minerbumping story is an auspicious occasion. Perhaps a more senior Minerbumping historian can correct me, but I do not recall ever seeing a 9 parter before. Some scholars believe that there are volumes deep within the vaults that hold 11 and even 12 parts. Who can ever know what lies in the long history of the ancient and esteemed New Order? Oh wait.. I'm AG now.. I forgot. Grrr Code! Y u ruin geme? Let me just say this. James 315 is using photoshop to doctor the screen logs. As I said in my speechs and my posts here before and I'll just say this: im not the guy with a trust problem. and oh ya, my brother is real and there are definitely no recordings of me saying otherwise. and oh ya, THE CODE DOESN'T ALWAYS WIN. that doesn't make sense because you always lose your ships. The Code indeed does ALWAYS win. Case in point, when have you ever proven yourself superior to CODE.? You have lost simply astonishing amounts of isk, corporations, and new players to CODE. And yet, you still consider yourself to be "someone worthy of respect and trust, that 'knows a lot about the game and can teach new players.'" Given your record as one of the all-time highest losers to The New Order, how can you possibly fathom that "The Code does not always win" and have it come off as anything more than yet another gasp of desperation from someone so obviously defeated? 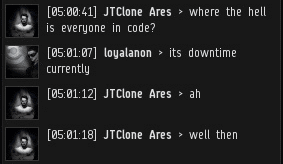 100% clear that "JTClone Ares" either doesn't exist, or is a deep cover code troll (meaning he is an alt of ??). Nobody would serve up so many victories on a bronze chalice so easily without being in on it from the evry beginning! Anybody in JTClones corps should be aware that it is just a code awox farm! Be smart! 1. Don't show up for the game.